Holiday.gr - Agriolefkes / ski center, a trip to a myth! Here you will find one of the best international standard ski centres, at an altitude of 1500m. 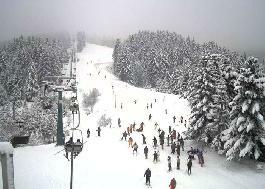 Agriolefkes was one of the two very first ski centres to operate in Greece. It is 27km from Volos, 2km from Hania and 12km from Portaria. Ski lifts constantly serving the skiers operate at around 500 people per hour. There are two single seated, one double seated and two rail lifts which assist the skiers to reach the slopes. The slopes "Thetis", "Panorama", "Falconera" and the "amateurs" all combine to make a total length of 5000m. There is also a slope for strength and two circle ones, which total 3000m in length. This is also a ski school here for youngsters and beginners. Been to Agriolefkes / ski center ? Share your experiences!